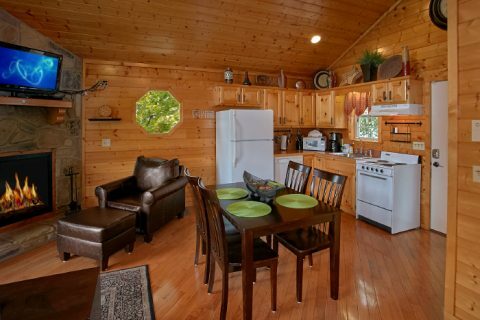 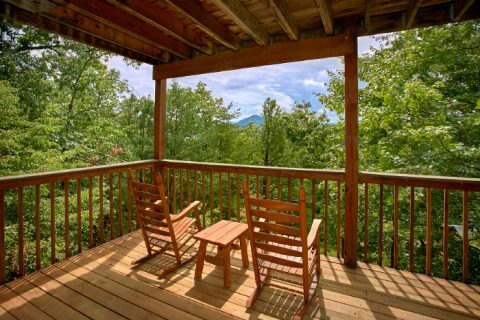 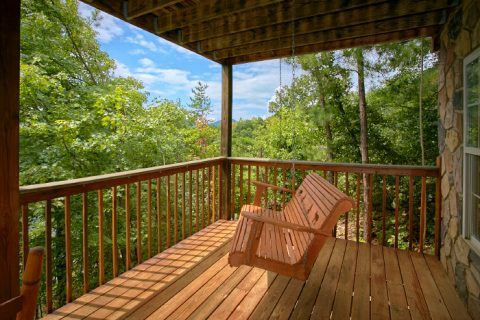 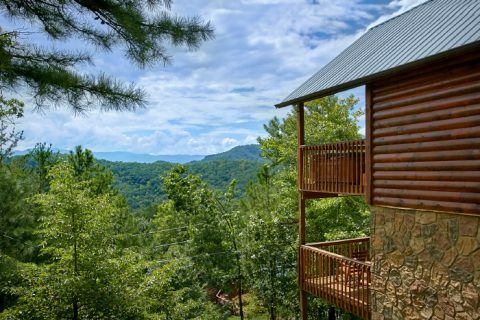 Our Smoky Mountain honeymoon cabin rentals offer guests the beauty of the Smoky Mountains and the tranquility of nature's surroundings along with a convenient location. 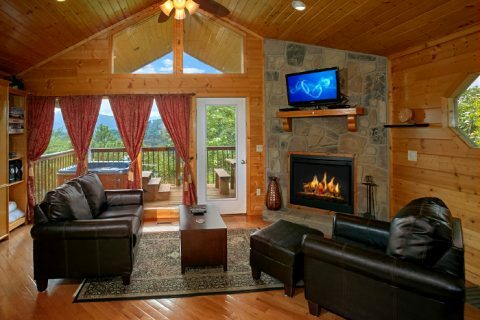 Nestled in a private setting with the perfect amenities for your honeymoon getaway or romantic Smoky Mountains retreat, "Ain't No Mountain High Enough" features fantastic views of the Smokies and creates the ambiance needed for a vacation to remember with your sweetheart. 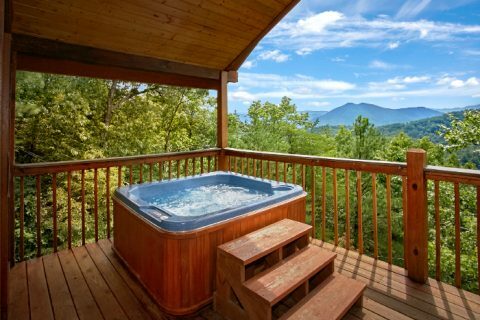 Enjoy this Wears Valley cabin rental's private hot tub as you soak in awesome views from the covered deck. 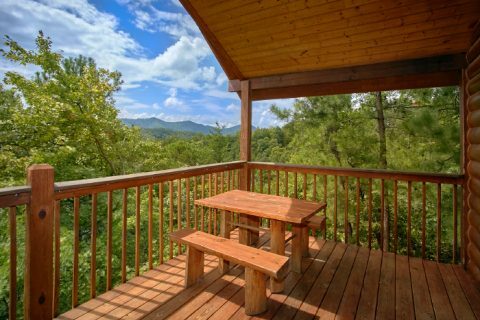 Additionally, the charcoal grill provides everything needed for a cookout in the mountain air at your cozy retreat. 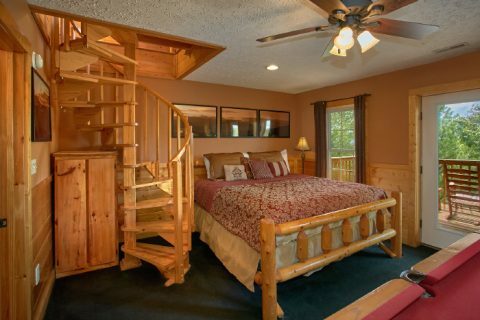 During the winter, open up the hidden bed in the living room, in front of the electric stone fireplace, and soak up the warm romantic glow of the fire as you cuddle together while watching a movie or satellite television. 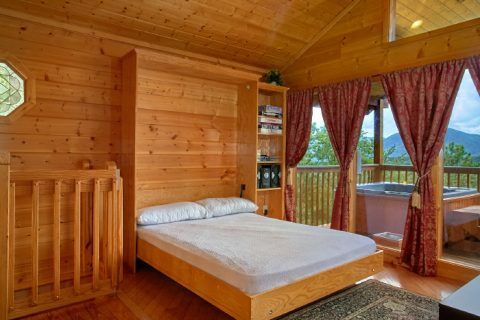 With the expansive king-size bed, this snug Wear's Valley cabin accommodates up to 4 guests. 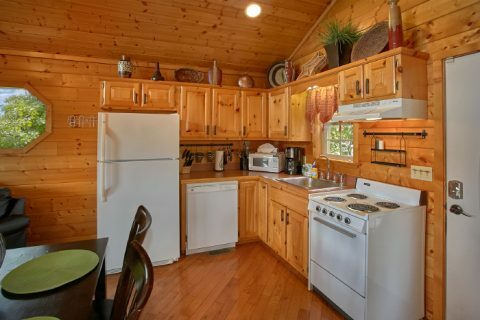 This Wears Valley cabin also features a fully equipped kitchen great for snacks and times you'd like to treat your sweetie to a romantic meal. 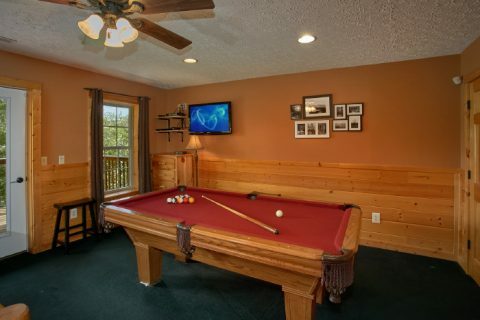 If you have a bit of a competitive streak, you and your sweetheart can enjoy endless games on the pool table. 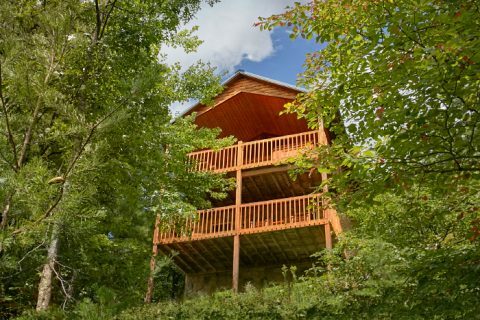 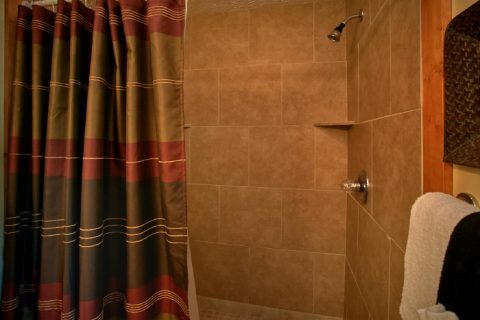 While your Wears Valley cabin provides you with the privacy you desire, it's just minutes away from all the area attractions, shopping, and restaurants in Pigeon Forge. 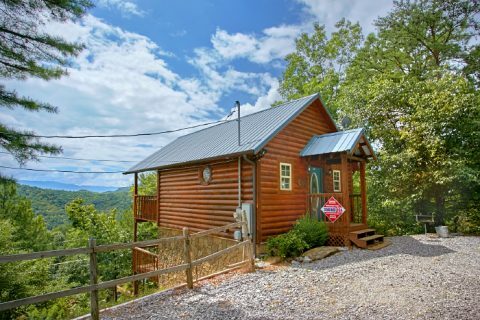 Wears Valley honeymoon cabin rentals also place visitors in a more relaxed setting, dotted with quaint mom-pop shops along the roadside filled with unique items you can't find anywhere else. 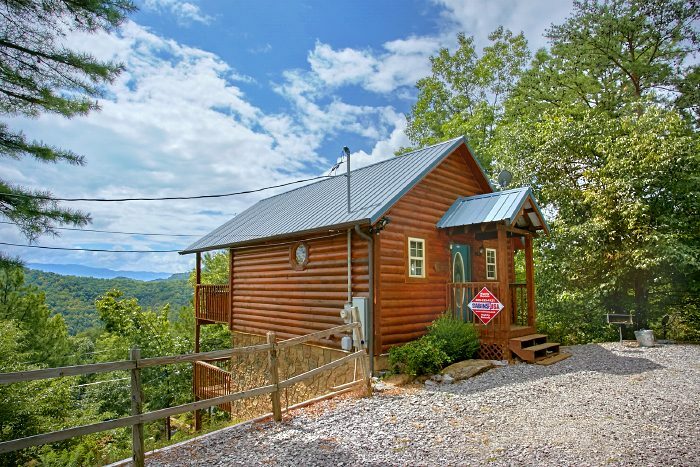 Book "Ain't No Mountain High Enough" or any of our Smoky Mountain honeymoon cabin rentals online for an immediate discount SAVINGS!